Well I have been a very slack blogger and for those of you who know me well, you will of course know that I have always struggled with the whole BLOG idea......lately I don't even read others blogs let alone update my own....hmmmm slack I know. I still love all the people whose blogs I read but I have been doing alot of soul searching and find that my time is better spent with my family at the moment. Wayne has now finished Uni, my daughter Kate has her last year at home next year and one of our close family is very sick...all of which have lead me to my next decision. I have sadly resigned from all my current DT's including Shop and Crop which was of course the hardest decision to make. Sasha and Paul have always been so supportive of everything to do with me and my scrapping and I feel like I am leaving my family not just a DT. 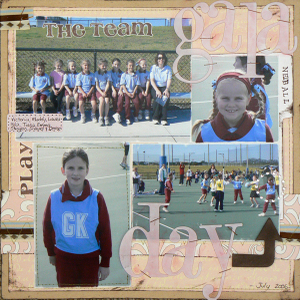 They have given me many wonderful opportunities all of which I have truly loved and enjoyed. Now if you would love to join this absolutely wonderful DT and little family then check out all the info here. Applications close 5pm EDST 15 November 2006. Sasha is increasing the team from 6 to 8 and has some very exciting new plans to put in place. So come on and put in your application to join the wonderful Evana, Jaimie, Kylie and Maree. In a not so happy coincidence for Sasha and the team, (and even though we are friends, neither of us had any idea the other was doing it!!!!) Alison has also resigned for similar reasons to myself. I will really miss her work!!! I still have one more project for Shop and Crop so I will finish in mid-November. Here is my latest LO...on Motherhood. 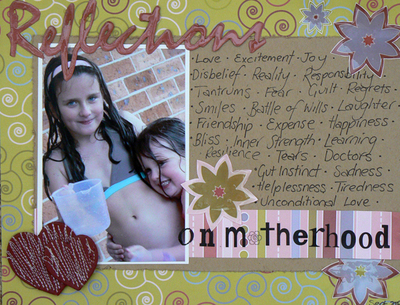 I used words in the journaling to describe all my different experiences of Motherhood. I have also created a Santa Book for you to collect all your children's memories of Santa which is available at...yep you guessed it....Shop and Crop. The next picture a Santa clipboard that I created for a class at Scrapabout Australia....as usual, it was a wonderful day. Thanks to all the ladies that attended. I will still be teaching classes and I am very excited to say that I will be teaching a Christmas class at my very own local Scrapbooking store Scrapbook HQ on November 18th!!!! So please if you are free drop in to say Hi!!! I would love to see you there. return to the How Dare You site early in the New Year. Speaking of which...be sure to check out the World Wide Dare they are doing at the moment ...very exciting. 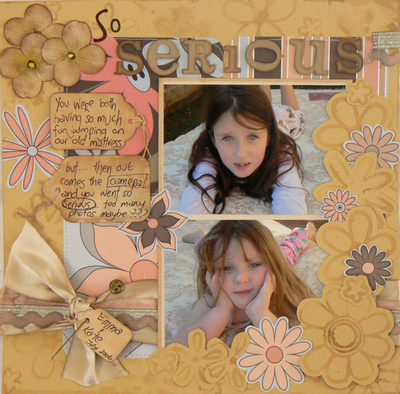 This is my double Lo for my class at Scrapabout Australia on October 21st. We will be learning a paper scrunching and gluing technique that I just love. These photos were taken on the second day of spring and the girls couldn't wait to get outside and get wet...and it is still a little cold for the pool...so yep...they had a water fight. 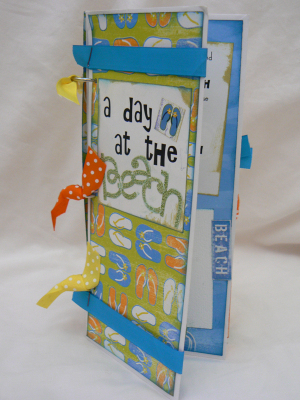 The second class I will be teaching is a Mini Book class.....this is such a quick gift to make...seriously. I made all these in a matter of 2 hours tops. They can be made from 1 piece of paper or if you prefer a hard cover you would need another tiny strip. I have made these ones as gifts for people and they are made in Fancy Pants, Gin X and Urban Lily. Such a great Christmas idea too!!! 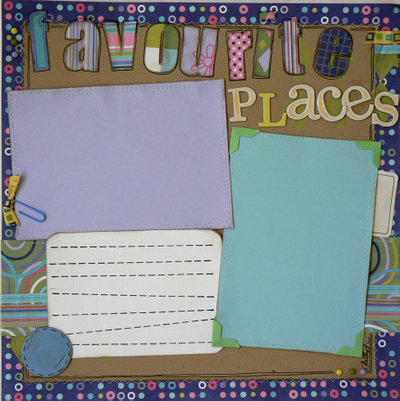 My third class is a clipboard to display your favourite photo......I don't have a picture of this (forgot!!!) but the sample I made in store is for a Santa photo....another great gift idea. this year I hope to get a move on on the gift making so i won't be doing it all at the last moment!!!! 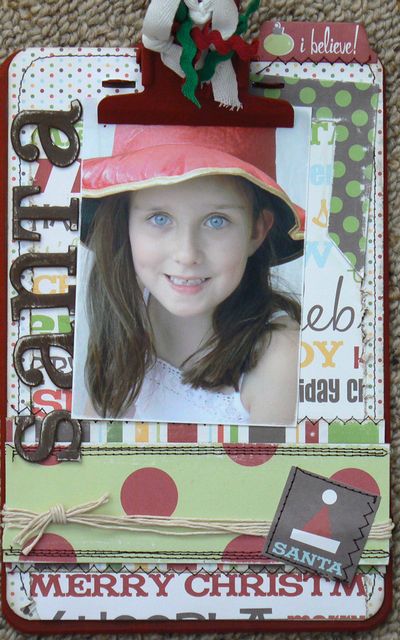 Are you looking for some scrapping ideas???? Then be sure to check out How Dare You an all Aussie site dedicated to having fun with scrapping and challenging people with Dare ideas. This weeks challenge was inspired by a fashion item....my Lo is about Donna Downey and my shoes and was inspired by the pattern on my shoes. To read more about the story go here as it is a little bit long to type out again. It is a privilege to be involved in this site with so many awesome scrappers....I am sure you will find something to inspire you. I had a lovely day on Saturday scrapping with my friend Alison Shearer. I really loved her scrap space and as we speak am having a break from tidying mine up yet again!!!! I managed to complete a fun little mini book that my good friend Sandra brought me back from the States and asked me to teach at my next home class. It was fun to put my brain in the corner and create something from instructions....thanks Sandra. I also did a quick Lo for the same class....the idea was from another friend who wanted me to use 4 specific sizes of photos...so I did. Very quick and another memory preserved. Just a few more little things to get done before I go away for the long weekend....I hope everyone else has a lovely break!!! Well I tried to update my blog last week and just when I had finished the computer logged me out!!! It has been playing up BIG TIME and it turns out I had a few viruses....including one which got into our bank account and transferred several thousand dollars to a bank account in Hobart!!! Now our internet banking is suspended and we are awaiting new passwords etc. On to better news....I have been scrapping up a storm!!!! 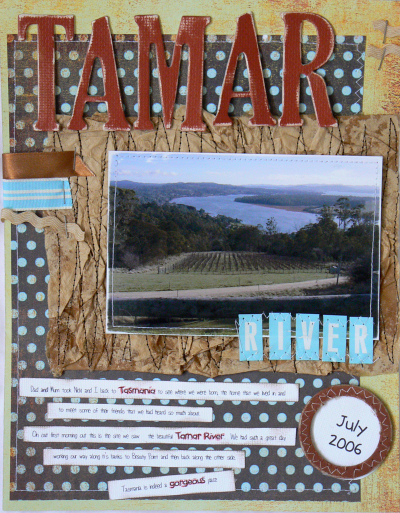 I have also been scrapping up my projects for my next class at Scrapabout Australia. All the classes for the next calendar will be revealed tonight at their VIP night....I can share them after that!!! 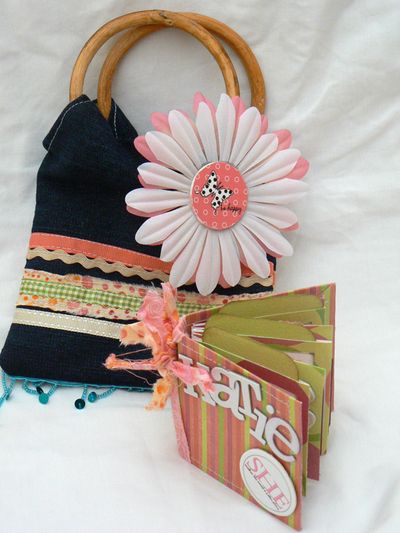 This is a bag and mini book I made for one of Emma's friends who turned 7 last week. I have made this bag before so it was easy to duplicate it. She loved it which always is so rewarding. I have also completed a small 8 x 8 page for a small boy who is suffering from leukemia and has to be away from home for 2 months. Andrea a friend of his sent out a call over the net for people to help her compile an ABC album to remind him of home and to give him something else to focus on whilst he is in hospital. Here is my page - I had the letter C and based the LO on cars. if you think you would like to help and have a few minutes to spare...contact me and I will put you in touch with Andrea. Once again I have loved using the new Heidi products....aren't those arrows so cool???? Because my camera was dropped just before I had to send off my class samples to Scrapabout Australia last time I did my classes....I was unable to upload the pages. I will post them here and add them to my photo album for those ladies who need to refer to them. I apologise for the delay. The Making Memories large letters are still in the store and I will post a picture when I get them back. The first Lo was for my Walnut Ink class. We dyed the ribbon, letters and blossoms and stamped the background with ink using the MM flower stamps. We also swiped the edges of the background and photo mat. I spent most of the class on the floor drying everything with the heat gun. I loved it. You ladies are the best...so willing and so much fun. i really appreciate you hanging around all day or just popping in and listening to me ramble....we are always so tired but it is so worth it!!! 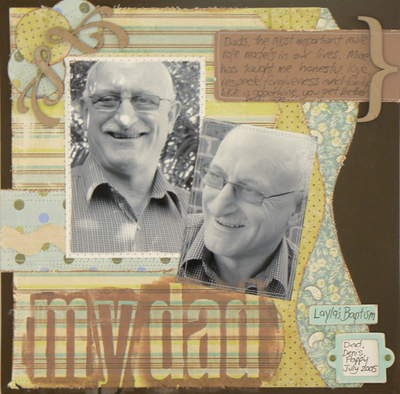 The next page is of my dad and uses the gorgeous Wild Asparagus range. it was a Waves class where we made waves from our pattern paper. We also used the Heidi masks (yes Heidi!!!) with ink. I loved how everyone's page came out...they all look so different. Ok gotta go..off to watch a school concert. Great news.....the super talented Kerrin Quall is coming back for more classes at Scrapabout Australia and even better Leanne has a few spots left in some of the classes. I managed to do some last time and was so excited by the things I learnt. The kits were fantastic too....so if you have some time free on Saturday 23rd September or Sunday 24th September and would like to learn more about chipboard, ribbon, how to do more by hand or even how to make better use of your scraps be sure to get in fast. Once word gets out I am sure they will fill up fast. 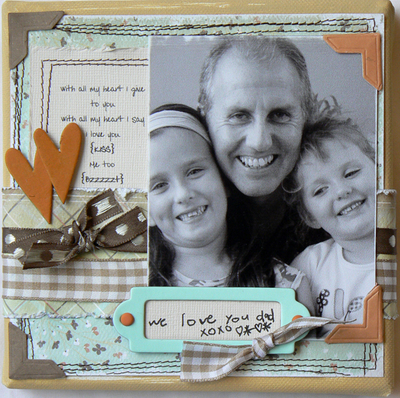 I am really looking forward to my class at Scrapbook HQ at Sutherland this Saturday 9th September. if you are around be sure to come and say hi and they also have a mega sale on as well!!!! The very talented Alli Peterson asked me to donate a LO to the Autism Association of Western Australia Early Intervention Centre. She has asked many scrapbookers to donate to the cause and will raffle an album to raise funds. These pages are from a CJ I am in...the topic was what is positive about yourself. A chance to make us reflect on the good qualities and not the negative. I used the yummy 3 Bugs...I am not a big purple fan (Hello Kathryn and Wendy!!!) I really enjoyed using this range!!! Here is my first ever canvas....I loved making it. I will give it to Wayne for Father's Day. This was my Shop and Crop online class on Friday night and we had such a great time...thanks to everyone who attended...as usual I had a blast. The verse on this canvas is part of Wayne's bedtime routine to the girls. It is a small canvas - 6 x 6 so it will look great on his desk. I am just home from 3 awesome classes at Scrapabout Australia. Ladies you are awesome...I always have the best time. Thank you for your support and your fun attitudes. I know we all get delirious at the end of the day but we do have so much fun.....can't wait for the next one!!!! Wayne had a roast dinner ready for me (well I had fish because I don't eat red meat) but i so love our family dinners and tonight was no exception. I am always stuffed after my classes because those ladies wear me out..he he he. 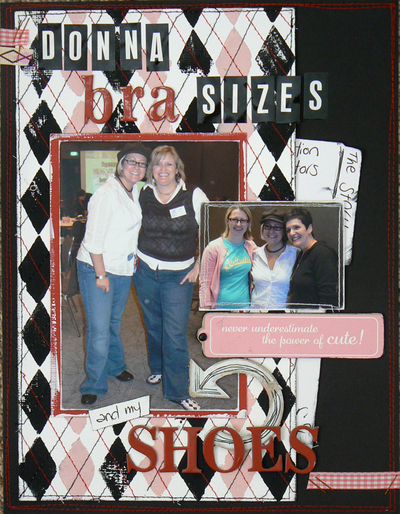 What a great time I had at kiwi Scraps. 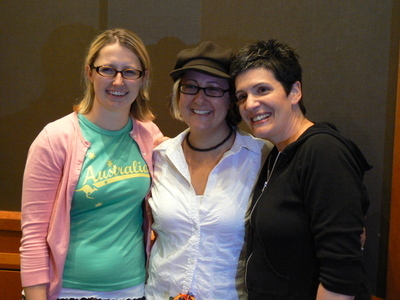 Ali, Cathy and Donna were just awesome. I could only attend the Friday sessions as it was Kate's 4th Birthday on the Saturday. I was lucky enough to get into all of Ali's classes and one of Cathy's. Unfortunately I was unable to do any of Donna's but I heard great things about them. 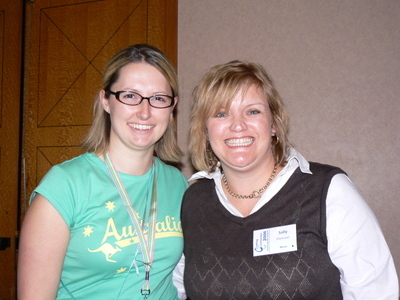 I really loved learning some techniques from Ali...she is awesome...so down to earth and fun. Cathy was hilarious too...and her son Coleman was a scream...he even asked the class if we would like his autograph. I did meet Donna and she asked me if the D in Sallyd was for my bra size!!!! By the way it is not...too funny. I really enjoyed catching up with so many old friends and finally meeting some other people that I have talked to for ages. I really wasn't myself on the day so if you have just met me for the first time....you have to forgive me. I had been really sick a few days before but was determined to attend. I found the crowd really overwhelming...but I loved it all the same. Congratulations to my good friends Trina and Evana who both gave birth to beautiful baby boys in the last 2 weeks. They breed them big in NZ - Daniel McClune was 11lbs and Joel Willis was over 10pds. Congrats to you wonderful ladies on the arrival of your BIG boys. 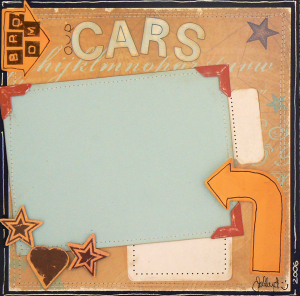 This is a LO I just did for Shop and Crop using Lilykate papers from the new Basic Grey range. Gotta love Basic Grey they never fail to impress!!! Be sure to check out the gorgeous creations from the other DT girls and if you are free on Friday the 25th August at 8.30 pm then be sure to join in all the fun of the Shop and Crop Cyber Crop. I am also teaching an online class but all the packs are sold so there is no room left. Should be fun. On Saturday I have 3 classes at Scrapabout Australia. I always love teaching there and we all have so much fun. 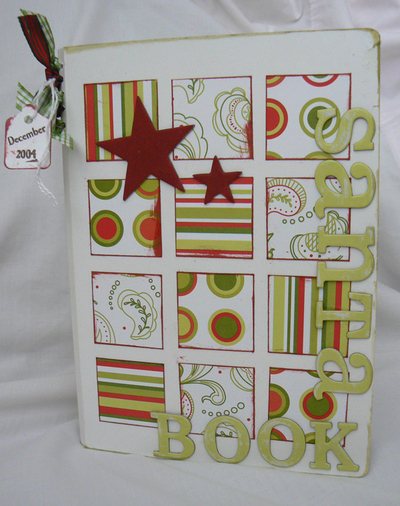 Then on the 9th of September I will be teaching a guest class at Scrapbook HQ at Sutherland. I am really looking forward to teaching here as it is my favourite local store. I would love to see you there. This the most recent LO I did for the Aussie dare site - How Dare You. We were challenged to use Coffee Filter paper on our LO. I tore mine and scrunched and glued it as a photo mat. It was so much fun!!!! Be sure to check out this week's dare too. This photo was taken in Tasmania when i was down there in July. What a beautiful spot it is too. Just a quick update (I need to be a better blogger!!!!!) of a CJ page that I did last week. The theme was Quotes and although I do love quotes, I always find it a hard subject to scrap as I don't have that many favourites. Desiderata was already taken....so I just listed a few of my favs. The page is based on stitching which was added for an extra challenge....Lots of hand stitching in there!!!! 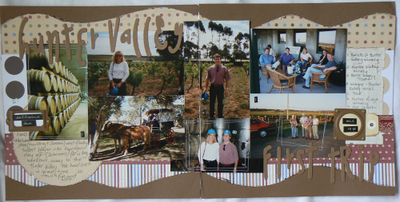 This LO is a quickie I did of our first Hunter Valley trip. I am loving using the wavy cutting technique atm and this was the result. Time to scrap some of those older photos when I was thinner and Wayne had hair...LOL. 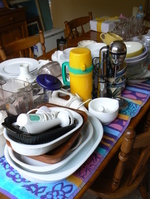 We are currently renovating our back room atm....it has not been fun!!!! 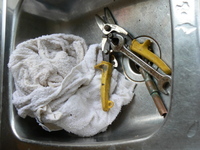 The other day I came home to find the cook tops out, no water, spanners in the sink and the mince for spag bol sitting on the counter (like it could be cooked there)....oh the joys of renovating. 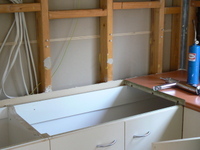 We have finally moved back into the room after new floors, benchtops, back door and a cupboard have been added. We are just waiting to decide on a splash back and for the lounge and blinds to arrive....then we move onto the lounge argh!!!! !